My Master's degree dissertation has become a book! Entitled Generalização da Periodicidade (generalization of periodicity), it is now available as an e-book in the Cultura Acadêmica website, maintained by Editora UNESP. 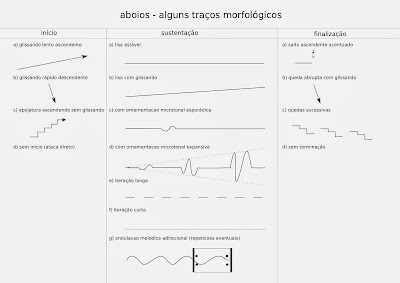 This work investigates the concept of generalized peridiocity, conceived by Belgian composer Henri Pousseur in the 1960s as he intended to expand possibilities of serial music poetics. 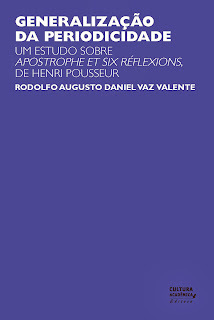 This dissertation includes an in-depth analisys of Pousseur's piano work Apostrophe et six réflexions and was oriented by Flo Menezes. Click here to download the e-book free of charge. Soon a physical copy printed on demand may be obtained via the same web address. 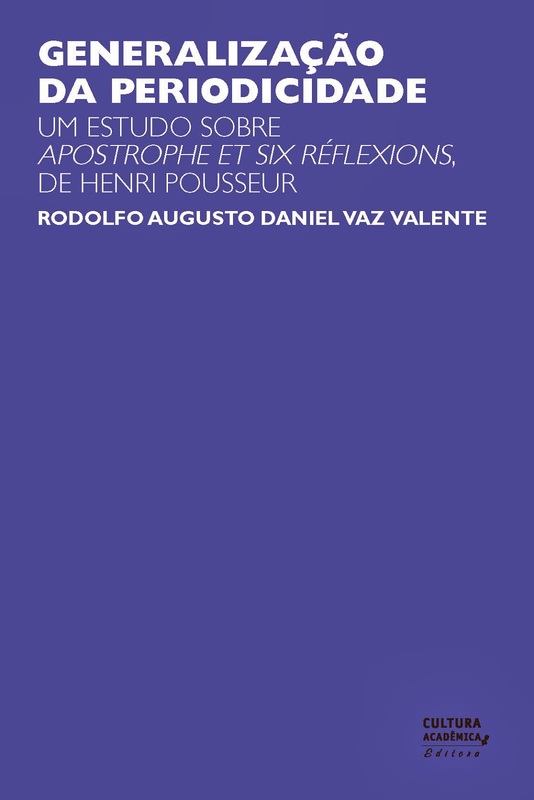 As I worked in this dissertation, I also wrote a this piece for solo vibraphone - réflexion apostrophique - consisting in a humble hommage to Pousseur. The point of departure is that musical form may be thought of as a correlate of sound synthesis, being a result of distinct periodicities that modulate each other. Although it's not an official part of the dissertation, this piece was premièred in the UNESP Arts Institute the day after it was presented. This is the live recording of this première, beautifully played by percussionist Rubens Celso. The name canto nenhum can be understood as "no place at all": a possible translation for the ancient word utopia. It can also refer to an absent voice. In this case, I chose as my model the aboio, a special kind of singing from the Northeast of Brazil. It's used to call the cattle, being closer to a kind of cry than to a form of chaint. Not intended for human listening, perhaps it's not exactly music. Thus maybe something else: a possible form of communication between man and nature, which draws us back to the terrain of utopia. 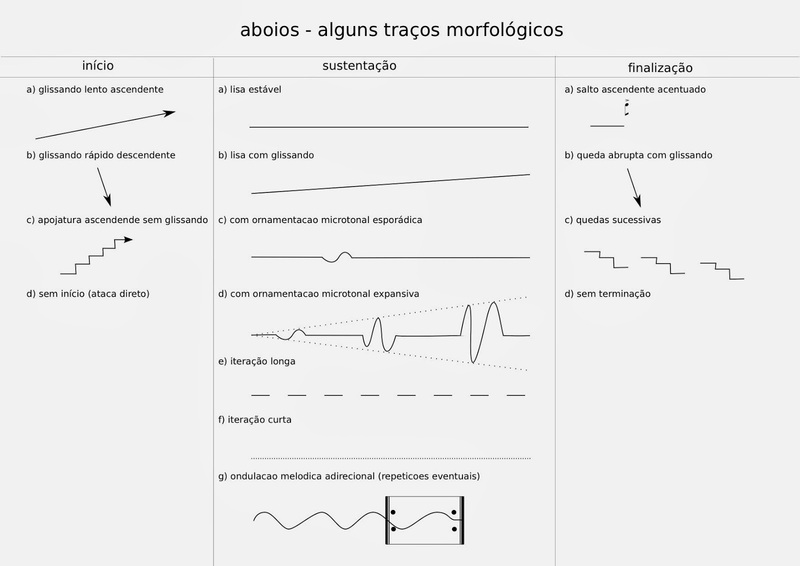 The aboios taken as a departing point are recordindg made by Mario de Andrade in the late 1930s during his "folkloristic missions". Inspired more by the ancestral connection between men and cattle described by Terence McKenna in his Book Food of the Gods, than by any nationalistic demagogy, I analysed the aboios as sound objects. Listening to them repeatedly, notes were taken on the different kinds of beginnings, sustains and terminations that could be observed. From these morphologies musical figures were developed so that I could bring to the realm of hearing an abstract structure based on prime number proportions and intervallic unfoldings of a single chord (using a procedure I nicknamed "harmonic LFO"). This piece was premiered 19th July 2009 in the 40º Festival Internacional de Campos do Jordão, by the chamber group of the festival. In this occasion, canto nenhum was awarded with the Camargo Guarnieri Composition Prize. 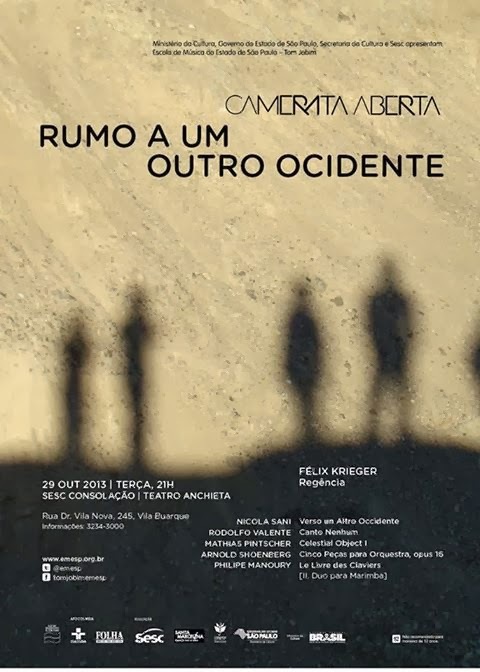 Four years later, it is delightful to listen to this piece live once again with the Camerata Aberta, conducted by Felix Krieger, October 29th at 21.00 pm in SESC Consolação, São Paulo. PS: Personally, the poetical investigation on the communication between two worlds that inspires this piece is tainted with a particularly dramatic nuance. During the process of composition my dear grandmother Janina crossed the threshold of this world as we know it. That's the reason why the score bears a dedication in her name. Excerpt from O Elefante de Marfim's first act or a musical-affective letter to F R on his big-headed beaches:"~ CATHERINE CLEMENTE, loses her memory and tries to retrieve it, which is the reason why she sees herself transmuted into Opera. With the help of Gilgameshivashtar she remembers that she is the embodiment of Oefro, Orfeo through the mirror. Has elephantiasis between her breasts, as a heart exposed outside. Naked. The ivory parts are so alien to the abstract game of chess as the hand that governs them." : (2013) is an acousmatic miniature composed specially for the NMEaniversário2@bandcamp album, intended to celebrate NME's second anniversary and feturing 22 works by 25 artists from around the globe. All pieces are inspired by the number 2 and last around 2 minutes. : revisits my retorno em linha reta (2012), taking the previous work as its own basic sound material. The entire last year's piece is submitted to several electroacoustic transformations, which have the number 2 as a common reference. Eight time compressions are performed, coresponding to powers of the number two, featuring exponents 0 to 7 (generating sound events 1 to 128 seconds long). Some of these materials are further transformed by means of oscillators set to frequencies such as 2, 22 e 222 Hz. From that point on, initiates the process of cutting, editing and mixing that sculpts the final shape of the piece.